Last week we met up with family at the zoo in Lansing to take in the lights and fulfill Liam’s life-long dream of meeting Santa. Until now we’ve never gone to visit Santa, because I don’t know how much I want to push the whole Santa thing so we don’t actively pursue it (plus I hate standing in line, especially with children – if you are reading this after 4:00 EST, you should laugh because I’m currently at the airport where there are lots of lines WITH my children). 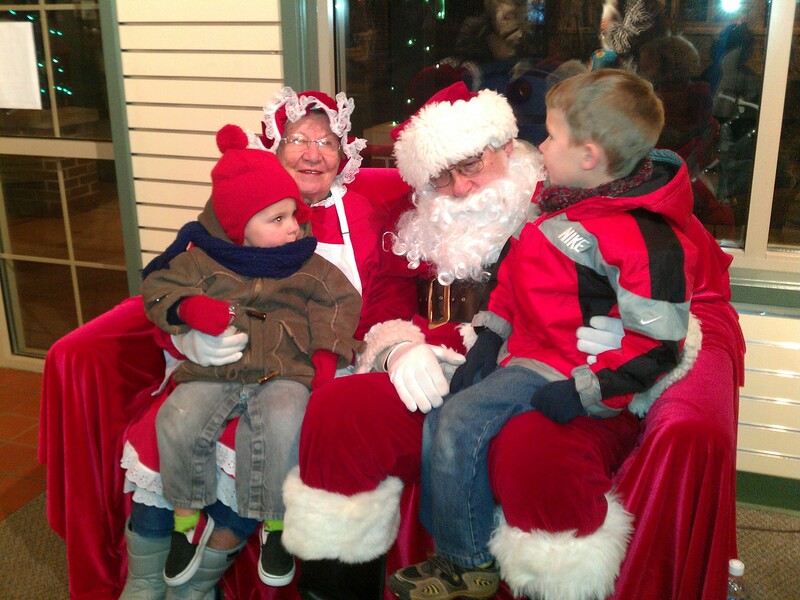 But anywho… the zoo had a Santa and Mrs. Claus. It wasn’t until after we got home and I was looking at the photos that I realize Mrs. Claus was actually my cousin’s wife’s mother (follow that?) who is a long-time volunteer/worker at the zoo. Glad we didn’t recognize each other in the moment because that might have blown Santa’s cover. Another thing threatening the charade was Sandy’s beard that kept slipping down, causing him to hold his hand up to his face in a thoughtful gesture. When asked what he wanted, Liam said he wanted a toy monkey (we were in the zoo gift shop after all – very smart thinking, zoo people). This was news to me and kind of a bummer since I had my Lego/Cars/Tag reader bases covered but hadn’t had the foresight to purchase a toy monkey. But my husband saved the day during an early morning trip to Meijer on Christmas Eve, there he found the game “A Barrel of Monkeys” and that’s what Jack and Liam received as their joint gift from Santa. Sadly, my kids weren’t as impressed with Santa’s responsiveness to their desires but I hope someday they realize how that gesture showed how much their dad loved them. That is magical.